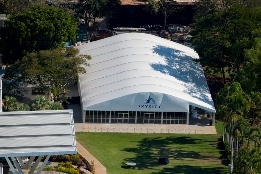 A local innovator and Skycity Darwin are at the forefront of a revolution in the building industry with what it is believed to be the strongest public temporary structure in the world. The Skycity Beachside Pavilion may look like another stylish marquee – but this ‘tent’ can withstand winds to the equivalent of a medium range Category 4 tropical cyclone. Colin West, innovator and owner of award winning Framelock Structures, is entering the Skycity Beachside Pavilion into the Guinness Book of Records as the strongest public, temporary structure in the world. The pavilion is certified to withstand a 69 metre per second wind load – equating to 250 kilometres per hour. Despite being told "it couldn’t be done", Colin West and Darwin consultant engineer Peter Russell designed the 25 metre by 40 metre temporary structure to comply with the National Construction Code 2013 of Australia. The temporary structure was built for one third of the cost to build a permanent structure of the same dimensions. The attractive ‘tent’ features a curved fabric roof, giving the internal structure a wave-like appearance, and has a 5 metre verandah with panoramic views of Mindil Beach. The pavilion covers a 1000 square metre area and is 6.5 metres high at its peak. The walls are solid and fitted with detachable windows, while an inflatable roof has been specially designed to cope with heavy rainfall. Manufactured by Roder HTS Höcker in Germany, Colin and Peter have designed each aluminium component, including rafters, columns, knee braces and purlins, which were custom made and carefully transported from Germany to Darwin. The specially designed marquee also features an innovative internal vent system that enables the structure to cope with potential changes to internal pressure in the event of a cyclone. "Framelock Structures and Skycity have been at the forefront of a revolution in the building industry in the Northern Territory and Australia," Colin West said. "Nothing in this building is off the shelf or standard – every element has been custom designed and built. "There are a lot of secrets we have included in the pavilion which cannot be seen by the naked eye." Consultant engineer Peter Russell said the structure could revolutionise the building industry, in particular the automatic internal pressure venting system Colin designed and created himself, which has a patent pending. Peter said the structure’s overall design will have wide reaching implications for mining and oil and gas companies who are building temporary facilities across northern Australia that need to be cyclone coded. "This internal venting system has never been used before to my knowledge as it does not rely on power and is very cost effective," Peter said. The air conditioning system is state of the art as it uses a lightweight fabric ducting which cost 12 times less than conventional steel ducting and is able to be taken down for cleaning and adds no additional weight to the structure. There were several challenges in constructing the Skycity Beachside Pavilion, including the fact it was built on a sacred site, which meant the concrete pad and footings could not penetrate deeper than 40 centimetres into the ground. The structure can be completely dismantled and taken away, leaving only a concrete pad, and is re-usable at other locations. The marquee has received a building occupancy permit as a class 9b building under the Northern Territory Building Act, issued by local building surveyor Lucio Maddalozzo from Cardno. Skycity General Manager Brad Morgan said the Beachside Pavilion was a fantastic asset for Skycity and Territorians, and it had already hosted many successful events since it was launched in July. "The pavilion allows Skycity to offer a new venue for functions and corporate events for our clients and enables us to host events year round without worrying about the weather," Mr Morgan said. "I congratulate Colin and Peter for their innovation, expertise and persistence." For more information please contact Colin West on 0411 473 347 or Penny Baxter, Michels Warren Munday, on 0437 522 532.